**** [FOUR STARS] While DOUBLE VISION begins as a tame story of unanswered phone calls and unanswered questions about the meaning of romantic love, it soon spirals into a chaotic roller-coaster reminiscent of an episode of “The Twilight Zone.” The blind (mis)lead the blind around a minimalist apartment set in a whirlwind quest for sanity, making most of our own living rooms seem boring by comparison. What Barbara Blumenthal-Ehrlich’s six main characters lack in their grasp on reality, they make up in humor and desperate action; their unreconciled decisions and anxieties about getting hurt (physically and figuratively) inspire both interest and uneasiness in the audience. And if the question of romantic love still remains a mystery (along with other inquiries, such as “What the hell just happened?”), the characters’ frantic adventure in getting there is never dull. – Jackie Oberman. You can choose your friends but you can’t choose your family. Big sisters, as some sage once said, are the crabgrass in the lawn of life. But sometimes, in theatre world, you get both siblings and friends. 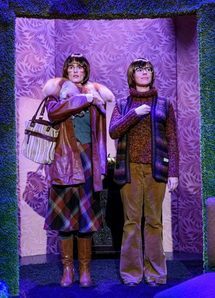 Something like that has been happening at Northern Light Theatre, where the two co-stars of Sister Sister have been bonding over the dark — no, dark and vicious and weird — comedy by American writer Barbara Blumenthal-Ehrlich. The play reunites two sisters after a 15-year estrangement for a celebration on the day of their mother’s death. It launches the Northern Light season on Friday. Trevor Schmidt’s production is the world première of the script. As Northern Light audiences can attest, they each know how to command the stage alone. 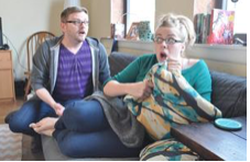 Both Rombough and Lambert have starred in highly unusual one-woman plays. Curiously, fundamentalist religion figured in both. Rombough starred as the heartbreakingly funny and naive 15-year-old, trapped in an extreme Christian sect in The Good Bride. Lambert won a Sterling Award for her work in The Pink Unicorn, as a church-going Texan conservative whose daughter has just announced she’s gender-neutral. They come at stage sisterhood from startlingly diverse theatrical roots. Calgary-based Rombough, who has a certain wide-eyed wholesome look about her, has a flourishing double career in theatre and burlesque. The latter is a rather unexpected antecedent to a memorable performance as a repressed/oppressed fundamentalist Christian teenager. “But I was excited because the script was so great, heartbreaking and incredibly hilarious,” says Lambert. She has also worked at The Maggie Tree (Category E) and Teatro La Quindicina (Witness To A Conga) since then. Northern Light Theatre is often way out there on the edge. Under the adventurous guidance of its artistic director Trevor Schmidt, it has become Edmonton’s most challenging theatre company – constantly probing human relationships and demanding intelligence, commitment and an open mind. It hasn’t always worked, but mostly it has – winning awards and giving us some memorable evenings. Schmidt must spend many hours poring over alt-theatre plays from all over the world each year and his productions are carefully chosen to feed his theatre’s unique vision. Northern Light’s latest is Sister, Sister – a world premiere, is written by Boston’s Barbara Blumenthal-Ehrlich, one of the busiest of alternative theatre playwrights in the United States. She says she grew up in a very quiet and supportive family – but you’d never know it from this often blistering, dark, highly emotional and often quite funny exploration of family dysfunction. As anyone who has a sister can attest (or who has observed sisters close-up), the relationship can be highly strung. Love and hate are often just a glance or experience away, emotions kindled by years of shared contact. And events that were felt very strongly when we were young are often remembered differently with the passage of time. “It’s safe to come back, mom is dead” is the message that brings together the sisters Janice (Louise Claire Lambert) and Dirdra (Arielle Rombough) after 15 years of distance and hostility. Something not immediately revealed happened in their late adolescence that tore them apart, and has lain festering between them ever since. The enmity between the two is real, as evidenced by the seething fury of Blumenthal-Ehrlich’s dialogue. They seem united only by a shared hatred of their mother. At first, Dirdra cannot even enter the house which carries so many memories that still hurt. Slowly, in dramatic fits and starts with many power shifts and startling surprises, their tortuous stories begin to reveal themselves. They both have careers and new lives, but there has been little healing. And over it all hangs the spectre of mother – an enclosed, unfeeling zombie from their youth. Janice is unforgiving. “I want to see her dead lifeless body,” she proclaims. She’s desperately searching for “one good memory” – the mother behind the eyes of the mother she knew. The play takes some ingenious and surprising turns from there. Schmidt’s fingerprints are all over this vivid, heartfelt production – from his claustrophobic ’60s set with shag carpet going up the walls, forcing the sisters into a stifling room, to the electrical current he pumps into his two leads. The director has dressed the two in much the same costumes, with their same shoulder length hair and owlish glasses, you are immediately struck at how alike they look. Lambert is brittle and unyielding (with a slight Valley Girl accent). Rombough, the one who stayed behind to look after mom – “we just got into a rhythm and that rhythm became our life” – is searching for something that was left of her sister when she just disappeared one day. While the two are cut from the same cloth, they are wildly different in temperament as they simultaneously reach out or push each other away. What an acting duel these two fine actresses give us – dipping, with probing intensity, into the primal forces that shape a family – even one as askew as this. Not to forget that the production is billed as a dark comedy, director and cast manage to find some solid nuggets of humour in the midst of all that pain and angst. Trustus Theatre will present the world premiere production of Barbara Blumenthal-Ehrlich's BIG CITY. 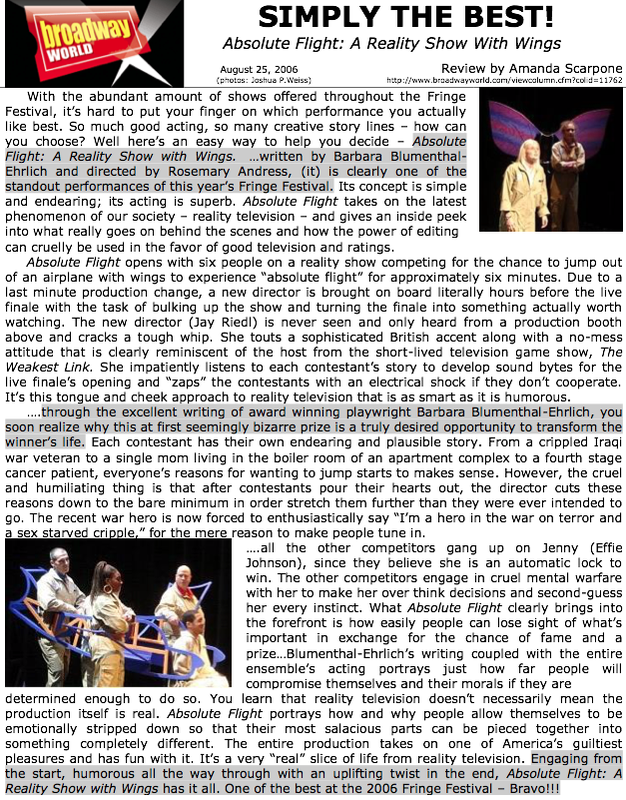 This show won the 2014 Trustus Playwrights' Festival and was chosen out of over 500 entries submitted nationally. This will be the first professional production of the script, running August 14 - 22, 2015 on the Thigpen Main Stage. The playwright will be in residence on opening weekend. A modern tale about 21st Century relationships and communication, BIG CITY introduces audiences to Jane and Joe. These friends have been living with each other for a while and are "just roommates," except for Friday nights and the occasional Sunday morning. Now he's drowning in urban angst and wants a deeper commitment -- a baby! -- but Jane says no. Deep down, are they really in love? Or is it just the narrowing of options and fear of being alone that comes from being closer to 30 than 20. Anything can happen over a meal of Chinese takeout and muscle relaxants, especially when unexpected guests invade the small apartment they call home. 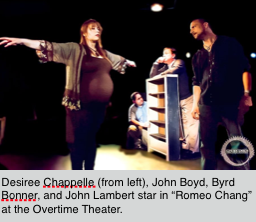 In short order, one of the main characters in the Overtime Theater’s “Romeo Chang” learns that she is pregnant and, after some “questionable blood work,” that she is dying. Jen (Desirée Chappelle) briefly considers an experimental treatment but decides against it after learning that it would kill her unborn child. Instead, she puts all her faith in Romeo Chang (John Lambert), a master of the Asian holistic art of qi-gong who is wrestling with his own demons. All she needs, she tells him, is for him to help her survive long enough to deliver her baby safely. She knows that she will die during the delivery, and has made her peace with that. Her decision does not sit well with her husband (John Boyd) or her dad (Byrd Bonner), but she doesn’t give them a choice. The piece, directed with a sure hand by Mark McCarver, doesn’t milk the emotional aspects of the story. So all of the sniffling in the audience at Friday’s opening performance was earned by the strong performances and by playwright Barbara Blumenthal-Ehrlich’s well-crafted work. It’s a deeply moving show. ​…Sacred Space, by Barbara Blumenthal-Ehrlich, directed by Nancy Bell, manages to surprise, educate, and move the audience with a quiet force. Set in a cloistered room reserved for prayers and preparation of the dead, on the morning after the Pulse Nightclub shooting in Orlando, the show both honors and challenges religious tradition while giving voice to the memory of those lost to horrific and inexplicable violence. Sophia Brown and Kim Furlow are Jewish women responsible for bathing and praying over the recently departed members of their congregation. The two are in the midst of administering to a deceased woman when their solemn reverence is interrupted by text messages from victims of the Pulse shooting, which start floating in the air above their work space. The women must decide why this is happening, what it means to them, and what they must do….Brown and Furlow turn in lovely, nuanced performances and the moment when most audience members realize the story unfolding was singularly forceful. The simple acts of dignity and care shown to the dead resonates without overplaying the tragedy.